Three more of its fighters have died today as Bunyan Marsous forces resumed its final push to destroy IS terrorists after a two-week pause. However, two IS car bombs were destroyed before they could reach their targets. 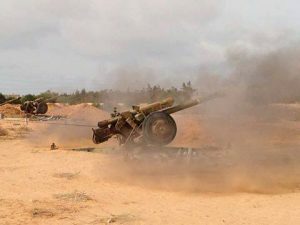 An artillery battery fired salvoes into the coastal district where IS fighters are still holding out in the Third District. Tanks probed forward and technicals lay down their normal fusillades toward the enemy. A reporter at the scene noted however that the tempo of the fighting was different and speculated that now that the battle was almost won, both men and commanders were reluctant to take yet more casualties. Over 520 largely Misratan fighters in BM have died and more than 2,500 been wounded. IS snipers and booby traps remain the biggest danger. Over the Eid holiday four soldiers were killed and others injured by sniper fire. Yesterday BM fighters completed the exhumation of the bodies of IS terrorists buried in sand dunes behind the beach. The BM operations room has confirmed the deaths of two IS leaders, Hassan Karami, the group’s mufti and Walid Al-Furjani. Both were Libyan.